Over the course of the centuries, explorers have combed the wilds of Russia in search of furs, river sources, and oceans. Little is known about Yermak’s early life (born between 1532 and 1542 – 1584). Ivan the Terrible wanted to push past Kazan into Siberia and he enlisted the Stroganov merchant family to organize the expedition. Yermak had worked for them in between stints as a river pirate, and set out with about 840 men around 1582 from a fort near Perm. He defeated the forces of Kuchum Khan, the last khan of Siberia and a descendent of Genghis Khan at Qashliq, a medieval fortress located 17 km from modern Tobolsk. Yermak’s forces were reduced and there was a supply shortage, but he befriended the Ostyak people and they pledged their allegiance to him. During a short window of peace, Yermak headed south to gain the pledges of local princes, while one of his men journeyed to Moscow to bring news to the Tsar and return with reinforcements. In 1584 Yermak and a number of his men were ambushed and killed by forces loyal to Kuchum Khan. Moskvitin (? - after 1647) was first mentioned in 1826 as living with Cossacks in Tomsk. A decade later he went towards Yakutsk with more than 50 men and made it to the Sea of Okhotsk, located between present day Kamchatka and Magadan. This made him the first Russian to reach the Pacific Ocean. He spent the remainder of his days exploring several rivers, learning about local tribes, and trying to drum up support for a military expedition to the Amur Region. He went to Moscow and left again for Tomsk in 1647 having attained the rank of Ataman. His later fate is unknown. Beketov (born c. 1600 – died c. 1661) was a guardsman before being sent to Siberia in 1627. A warlord tasked with collecting tribute from the Buryats, he became the first Russian to enter Buryatia. In 1632 he and his band of Cossacks founded a fort at what is now Yakutsk. He established several more forts and collected taxes for Moscow. 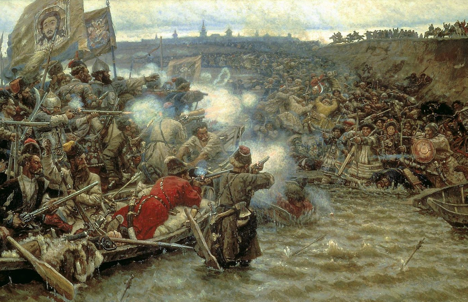 In 1640 he transported the duties he had collected and was appointed a Cossack commander. In the early 1650s he set out on a new mission to Buryatia and founded Chita (1653) and nearby Nerchinsk (1654). In 1655 he was besieged by the Buryats, but managed to escape and ended up in Tobolsk around 1661, meeting with Avvakum, an Old Believer leader who resisted reforms to the Orthodox Church. With more in common with Leif Erikson than Christopher Columbus, Dezhnev (c. 1605 – 1673) was initially recruited as a government agent, serving in several Siberian towns. He went to Yakutia around 1639, where he collected tribute before founding a fort, which then was the eastern border of Russian lands. In 1648 several expeditions set out to explore what was further north and east. Dezhnev most likely went along the Kolyma River before sailing to the Arctic Ocean. His boat was wrecked and with his remaining 25 men walked for about 10 weeks until they came to the mouth of the Anadyr River. A year later the crew had dwindled to about 12. He was eventually found and spent a few years in the area collecting tribute and walrus ivory before traveling to Moscow where he died. In his expedition, he may have made landfall on the Diomede Islands, located in the middle of the Bering Strait, which separates the United States from Russia. This would have placed him in the Strait a full 80 years before Bering himself. Atlasov (born between 1661 and 1664-1711) was first mentioned as collecting tribute in Yakutia. He was appointed the warlord for Anadyrsk, a fortified outpost in the northeastern-most stretch of Siberia that was under frequent attack from nearby tribes. In 1696 he sent a small mission to explore Kamchatka, which was still unknown, and they returned with strange writings from the wreckage of a Japanese boat. A year later, Atlasov went south with a crew of 125 men on reindeer to explore the peninsula. He eventually made it to the southern tip, where he battled with the Ainu people. He returned to Kamchatka’s north and ordered that a small fort be built. He spent the rest of his life largely plundering, although he was released from prison to go to Kamchatka again to restore order in 1707. Bandits murdered him in his sleep in 1711. Bering (baptized 1681-1741) became a sailor as a teenager, and served in the navy of Peter the Great. Peter selected him to lead the first Kamchatka expedition to establish if North America and Asia shared a land border. After that journey, Peter promoted Bering to Captain Commander. During the second expedition he was separated from his deputies and made a landing somewhere in southeastern Alaska, before weather made him turn back. He and his surviving crewmates were forced to take refuge on the Commander Islands in the south Bering Sea, 175 km east of Kamchatka. Renamed Bering Island in his honor, he died here along with his 28 remaining crewmates. Chirikov (1703-1748) was Bering’s deputy. In 1741 they departed in separate ships from Kamchatka and never saw each other again. He became the first Russian to go on land on North America’s northwest coast and mapped a number of the Aleutian Islands, including Kodiak Island, whose largest settlement would become the capital of Russian America in the late 1700s.